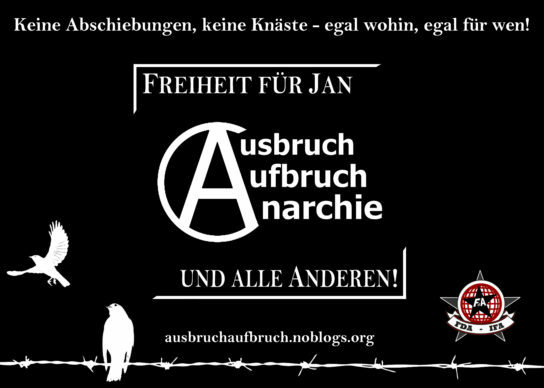 This campaign was started to give an anarchist answer to the repression following to actions of the 31st of May 2017 in Nuremberg. For further information about that day and why it is important to combine our anti-rascist, anti-repression and anti-state struggles within this campaign, view the text below. 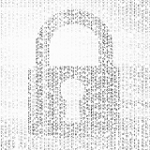 If you have questions, wish for further translations and/or want to send us information about solidarity actions to be published on this blog, please write us an encrypted message to: ausbruchaufbruch[at]riseup.net. On the 31st of May 2017, a student of a vocational school in Nuremberg (Germany) was to be deported to Afghanistan. His classmates did not accept this and reacted, together with hundreds of others, with a blockade to the attempted deportation. The police‘s answer to this was as typical as it was brutal: In the end, there were several injured and arrested people. To penalize those who opposed the deportation, the judicial authorities made use of remand prison and are applying the recently tightened law about „resisting and/or attacking an officer of the law“ (§113/114 StGB). Dozens of people are accused of participating in the blockade. To distract from the good reasons for the demonstrators‘ actions, their anti-racist protest is being criminalized. This proves to be a strategy that the german state frequently and willingly uses to prevent an effective approach against its racist practices of sorting out and deporting people. The fact that the 31st of May was a great example of how successful direct action in solidarity can be, is probably just another reason for the state to show exceptional harshness against the accused. 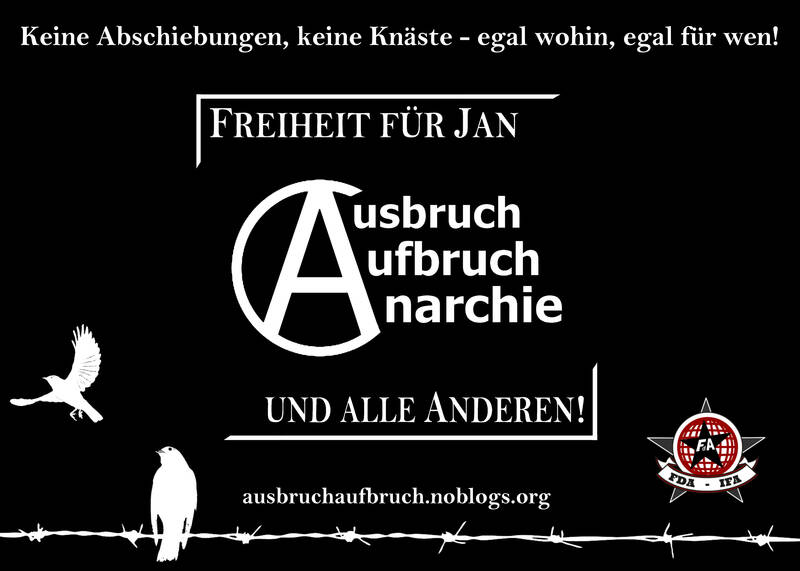 With Jan being one of the accused (among many others), the repression now is also directly concerning an anarchist. We – friends, comrades and supporters of Jan – are convinced that this link is no coincidence. Right after the 31st of May, the Bavarian government tried to split the protesters into ‚non-violent students‘ and ‚militant radical-left autonomists‘. This division is supposed to support their tale of a friendly, peaceable police, which only had to become excessively brutal to react to the attacks, that militant opposers of the deportation allegedly had started. As a consequence of steadfast antifascist action, Jan has been condemned in court before. This earlier conviction makes him perfectly suitable for the picture of an activist who is threatening to the state and to cops. Somebody who they successfully criminalized in the past already for his anti-authoritarian actions. It have been Jan‘s anarchist ideals which made him oppose the violent deportation of a young person on that 31st of May. Because of his radical anti-state convictions it is to be expected that the legal authorities will feel called to aim at an extraordinarily rigorous penalty for him. And yet, despite having been criminalized before, in the end Jan is only one of so many accused after the 31st of May, some of who face trials under similar conditions. And with regard to the large number of anarchists who currently are threatened and affected by state oppression, his case appears to be almost insignificant. But the repression against Jan must not be seen isolatedly. It is part of the list that is growing longer each time when the state once more tries to silence anarchists. Our bitter anger against the penalty that is threatening Jan, fans the same fury that we feel when we read about the cruel arrogance, with which the german state locks up comrades after the g20-summit. It is the same cold rage coming over us when we hear about the state murdering an anarchist in Argentina, who fought against capitalistic land-grabbing. It is the same relentless fury that drives us, when we find out about the greek government tearing down refugees‘ squats; when we see the turkish state invading and trying to destroy the free and emancipatory communities in Rojava. It is our struggle for freedom that unites us with all of these anarchist comrades and friends all over the world. For a freedom in solidarity, where society no longer feels like it needs to guard itself with prisons and oppression from those ideas, that could actually put an end to the omnipresent exploitation and inequality. Where ‚state‘ and ‚police‘ have become nothing more than a very bad joke, and where prisons and the repression authorities have been torn down once and for all! So let us give an appropriate answer to the state‘s attempts to intimidate us: Let us give a clear expression of our rage against the attacks on Jan and all of us! And let us keep on taking no matter which actions to oppose racism in state and society in each and every possible way!